I have four cards to share today as I have my DT card & as I keep forgetting to share some of the cards that I've created using Simon Says Stamps fabulous monthly card kits I thought I would share some of these today as well. If you have them we would love to see them but as always it's not compulsory to use them to enter our challenge. This week I am featuring Wplus9's beautiful Freehand Florals clear stamp set & I wanted to try something different & use minimal supplies & I have only used one ink pad to create this card! All of the floral background has been stamped using only my Hero Arts Soft Sky shadow ink pad, & I have used my Tonic Tim Holtz stamp platform to enable me to repeat stamp to add more depth to the different elements. The sentiment is from Simon Says Stamps You Matter stamp set & it has also been stamped using the same shadow ink pad & mounted onto fun foam & I have added Simon's lovely You die to complete my greeting. Kraft card stock, Elizabeth Craft Designs double sided tape, Elizabeth Craft Designs Soft Finish Card Stock, Tonic Guillotine, Acrylic Blocks, Duck Egg Blue Crystal Drops, Pretty Pink Posh Starry Skies sequins, Cuttlebug. Next up I have a few cards using some of Simon Says Stamps fabulous monthly card kits. 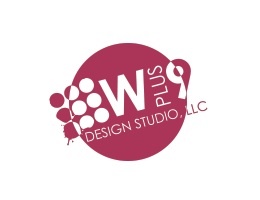 Supplies - May card kit, vellum, white embossing powder, Versamark watermark ink pad, Nuvo Sea Breeze Jewel Drops, SSS Green Leaf ink pad, Nuvo Glue Pen & Prisma Glitter. Supplies - June card kit, Copics, Sakura white gel pen, Bubblegum Blush Crystal Drops, X-Press It copic blending card. Supplies - June card kit, Big Hello die, Flickering Butterflies die, Silver Foil Crystals & Antique Rose Crystal Drops. 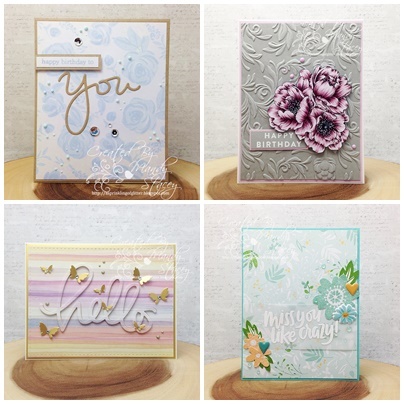 For more inspiration using Simon's Card Kits take a peek at the lovely Card Kit galleries. WOW, Mandy, what a bevy of beauties today! I adore them all, but there is something so sweet about your card for this week's challenge - love the soft blues mixed with kraft! Gorgeous cards Mandy :-) all of them are fabulous! Some true beauties lovely. That hello card is gorgeous. Wow pretty gorgeous creations..Love these. Mandy these are simply gorgeous! Love the soft colors! Mandy, this is gorgeous! Your coloring is exquisite, and what a beautiful embossing background! Stunning! Hugs!